So you’re hosting a Halloween party or attending a potluck and want to make sure there are some healthy Halloween snacks. The easiest and most versatile thing you can bring will always be a plate of vegetables, but how boring is that? 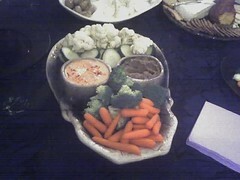 Even with the slime green color of celery and blood red of cherry tomatoes it’s just not a very spooky food on its own. Like all Halloween recipes, the spooky look is all in the presentation. 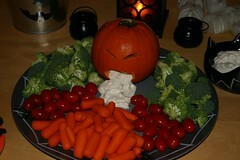 It’s what transforms a standard pile of fresh veggies into a puking pumpkin or spooky skeleton. First, start with a wild variety of colorful veggies or other whole foods. Think outside the box here. Start with the classics then branch out into some really exotic produce. Check out our huge list of Halloween colored foods for ideas. 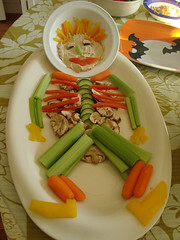 Then take a cue from these healthy Halloween party food ideas and transform your veggies with a little creative culinary magic. Be sure to consider the serving tray and surrounding presentation, too. 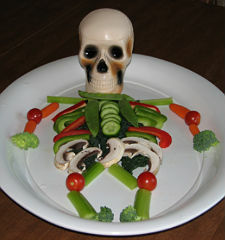 Halloween plates do wonders for improving the look of a creepy meal. 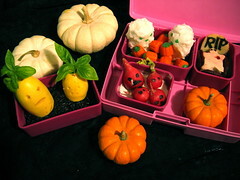 For more ridiculously cute healthy Halloween treats for lunches, check out all these creative Halloween Bento ideas. 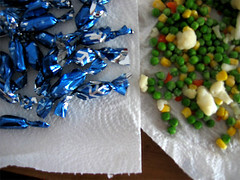 They’re time consuming, but perfect for your kids lunchboxes or to knock the socks off your coworkers in your own lunch. 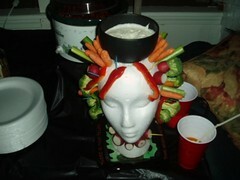 If you just can’t come up with a creepy or “gross” idea for presenting your food, make your table do all the work. 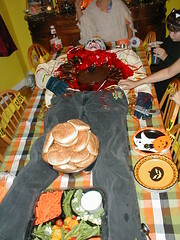 As seen in the Dead Body Food Display you can arrange your table as the final resting place for some unfortunate soul and just nestle the trays of food inside his guts. 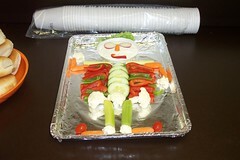 create your own Halloween Veggie Platters.